“A single grain of rice can tip the scale. One man may be the difference between victory and defeat.” This quote, spoken by the Emperor in “Mulan,” came to mind last week. 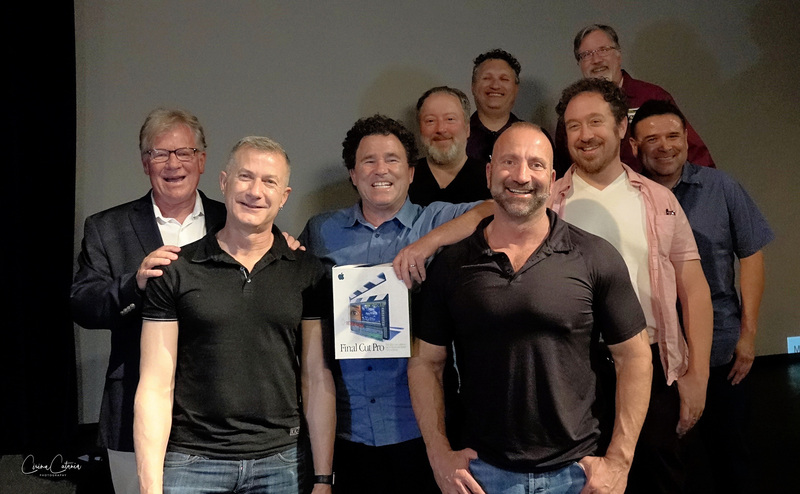 Last week, I attended the 18th birthday celebration of the Los Angeles Creative Pro User Group. There were about 200 people in the audience. Partly, the event was to celebrate the user group, but, more broadly it celebrated the history of our industry. And one name is interwoven throughout that history: Randy Ubillos. 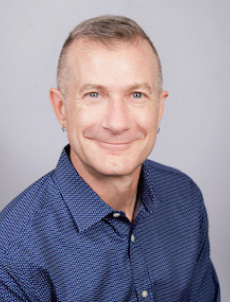 Randy was the designer, architect and lead engineer for the first versions of Adobe Premiere, Apple Final Cut, Aperture, and Apple Final Cut Pro X; to name only a few. The highlight of the evening was a conversation between Mike Horton, Head Cutter of the LACPUG, and Randy Ubillos. Their conversation took us back to the very earliest days of the digital revolution – starting around 1990. Though, actually, Randy began earlier – his initial fascination with media was sparked by being on the AV crew in high school. As I’ve said before, the world of today stands on the shoulders of the past. 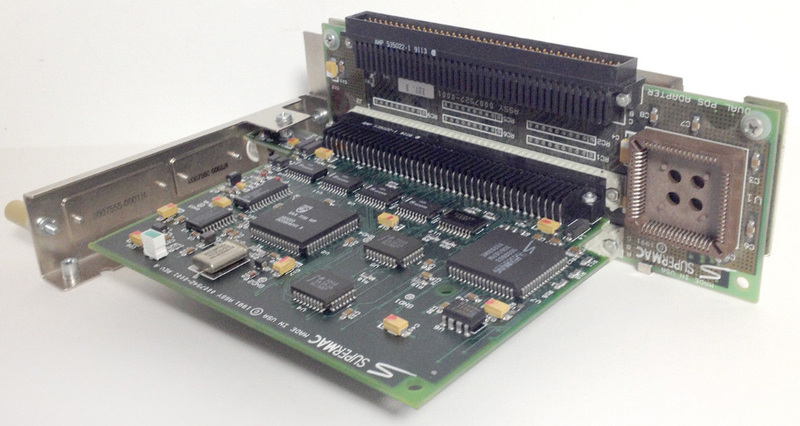 The vast transformation of the media industry from analog to digital began with a simple challenge to Randy in 1989 when he was working at a company called Supermac Technology to design a way to add video capture to a graphics card. In the process of figuring this out, Randy created a program called “Real Time,” which was acquired by Adobe and became Premiere, which first shipped in 1991. 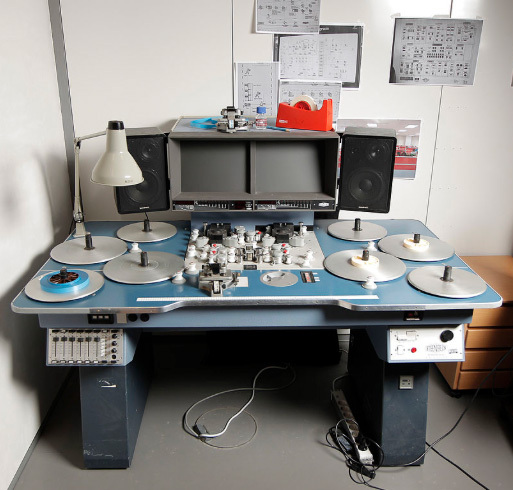 When Premiere was released, this is how we edited film: using a Steenbeck editing table. It didn’t actually edit, it simply allowed us to sync and display images more easily than other gear at the time. NOTE: Here’s YouTube video illustrating how to edit on a Steenbeck. This is what replaced the Steenbeck: an early screen shot of the Premiere interface. (This shot is Premiere running on Windows.) Not just display, but editing built into the same interface. 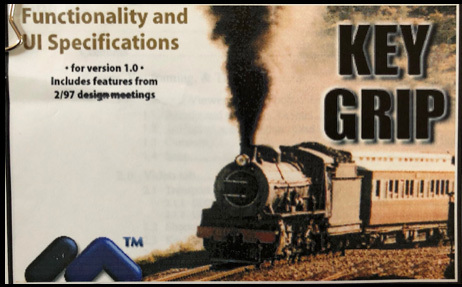 Next, Randy started working on a new editing app, code named “Key Grip” around 1996 for Macromedia. It was demoed in stealth mode at NAB 1998, but Macromedia didn’t want it. They wanted to focus on the web. A month later, Apple acquired and renamed it. The next year, Apple formally launched Final Cut Pro at NAB 1999. What Apple brilliantly did was combine the power and price of Final Cut with FireWire. This put digital video into every Mac computer starting in 1999. And the world of digital media exploded, carrying us along with it. 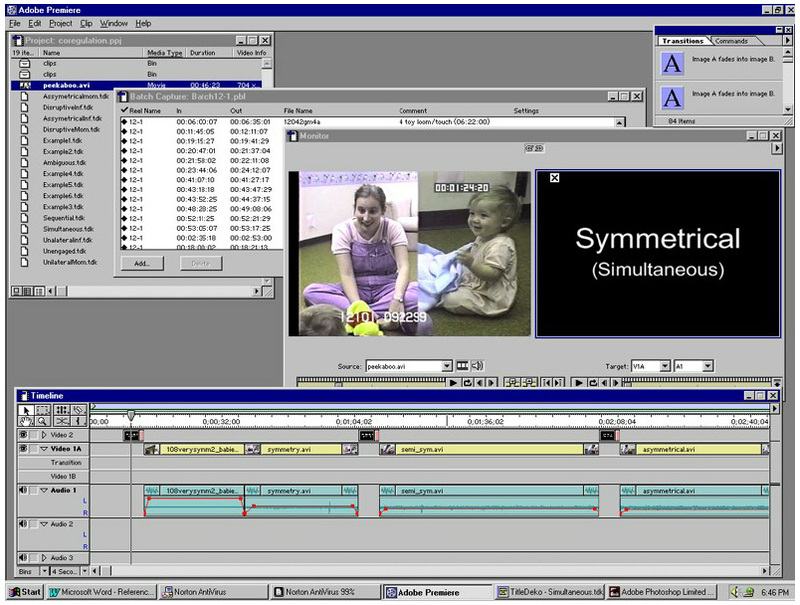 NOTE: As a piece of trivia: Paul Saccone did the first official demo of Final Cut at NAB 1999. As I sat and looked around at the meeting, I saw the movers and shakers that made our industry possible. Randy Ubillos, of course, but also Paul Saccone, Michael Wohl, Josh Mellicker, Mike Horton, Ramy Katrib, Cawan Starks, Daniel Fort, Philip Hodgetts, and Bruce the Wonder Yak. Along with the memory of those who were there at the beginning who are no longer with us. All these people met, shared ideas and built companies at user groups. With the wealth of information available on-line, its easy to think everything is accessible from the keyboard. But, last night, at the user group, I was talking with the product manager for DaVinci Resolve, an engineer working on unreleased software about new features, a developer of new VR training, answering technical questions from other members and, in general, seeing people that are almost impossible to see at a trade show. They’re just too busy. The world is a strange place. Answering a simple question of “how can we do this?” began a transformative movement for an entire industry. Strangers meet, friendships develop and magic happens. We stand on the shoulders of giants. User groups have fallen out of favor in these days of on-line everything. Which is a shame, because user groups are a great place to meet the people you don’t know, solve a problem without calling tech support, or discover something new that could light a candle under your career. It happened twenty years ago. It happens today. That it will continue to happen tomorrow is what gives us hope for the future. It was a magical celebration. I was honored to be there. Here’s a link to Part 1 of Mike and Randy’s interview. Here’s a link to Part 2 of Mike and Randy’s interview. Larry, was the interview with Randy recorded? If so, can it be seen on-line? It was recorded, but has not yet been posted. I get that this is a FCP piece but it completely jumps from film editing to Final Cut and Premiere as the first NLEs. Skipping over the fact that Avid was demoing at NaaB and delivering a real product before either Premiere or Final Cut, not to mention early pioneers like Lightworks or Media 100 that were there before Premiere and FCP as well, I believe. That is a totally fair criticism. While I did not intentionally skip EMC / Avid / Media 100 – all of whom predated Premiere, it could also be argued that none of those three took digital media mainstream and outside the high-end studio like Premiere and Final Cut. My goals for this article were to showcase the impact one individual can have, and emphasize the importance and relevance of user groups. 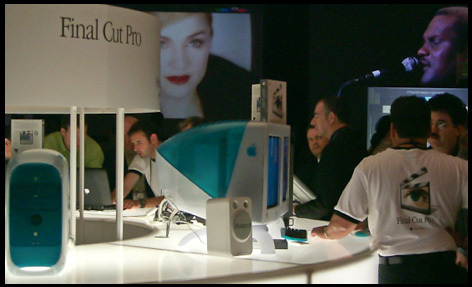 Could those be a pair of Apple Studio Displays rather than iMacs in the photo of the Final Cut booth at NAB 1999? As I recall, the iMacs were a lot easier to move about! Good catch! The iMac was released May 6, 1998, so they were available. However, the iMac sat flat on the desk while these two units have legs. Thanks for the article. I worked w/Randy at SuperMac. This all started w/a codec called CinePac. He developed Cinepac in his spare time while working as a developer at SuperMac. Brilliant guy. Have made many videos on products he had a hand in. Thanks for writing. I remember CinePac. It was my first experience with digital video and I thought it was magical. Randy Ubillos spells his surname with two Ls, I’m pretty sure. You might want to do a find/replace on this post. Good catch! All typos fixed. I also added links to the interview Mike and Randy did which is now posted to YouTube.